APD 2018 is the 4th edition of the Asia Policy Dialogue (APD), the regional platform for promoting social economy public policies by bringing local authorities, practitioners, researchers and policymakers in the region. 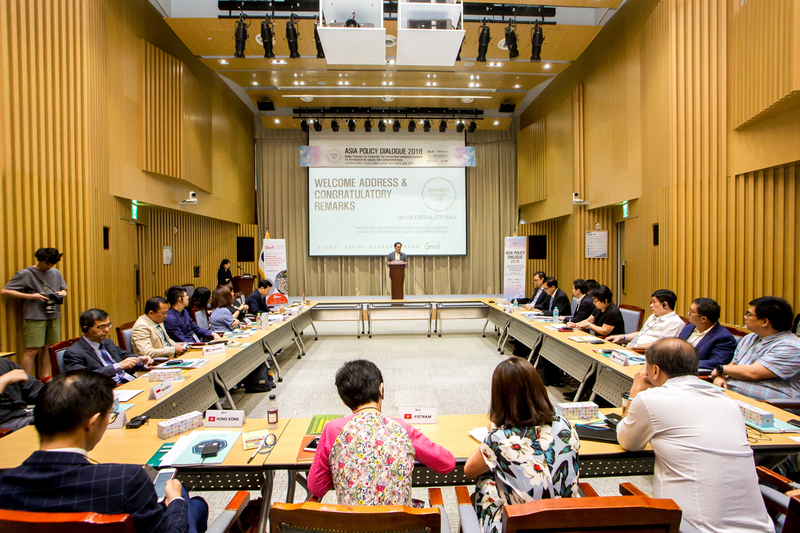 APD 2018 focused on different strategies of financing the social economy across ten different countries in Asia. * For programme details and concept note, please refer to the attached documents. To interpret the theme of the GSEF2018, “Social Economy and Cities: Values and Competitiveness for an Inclusive and Sustainable Local Development” in the context of Asia, primarily focused on the financial system for supporting SSE organisations as a pre-discussion of the GSEF2018. To discuss what kind of policy measures to be adopted to expand the SSE organisations’ social impacts and competitiveness in the market and how the process of policymaking and implementation should be done. To offer opportunities for participating GSEF members and partners to brainstorm and search for a more specific and viable collaborative project through the network. To develop the Asia Policy Dialogue as a regular forum on social economy policies in Asia and a networking platform for policymakers, advocators, and practitioners of SSE, based on the evaluation and outcome of the last four policy dialogues of GSEF. What are the characteristics of the social economy in Asia to be recognised in its social values and competitiveness for an inclusive and sustainable local development? How the funding and financial system to promote social economy could be established and strengthened? What are the suitable social finance schemes according to the stage of growth among Asian social economy enterprises in their local economic and social contexts? What kind of legal consideration and policy initiatives are required for the finance for the social economy to be managed adequately to maximise the social impacts of SSE enterprises? How can the cooperation between cities through international network strengthen each region’s social finance ecosystem? Since 2014, the APD has played a key role in promoting knowledge exchanges between policymakers in searching for the best ways of co-constructing public policies, establishing eco-systems for supporting the Social & Solidarity Economy (SSE) and social innovation to tackle various societal and urban challenges in Asia wherein social enterprises are playing an increasingly pivotal role in the provision of social services as well as serving as a catalyst for industrial innovations.